2. QRP Labs at Dayton FDIM and Hamvention, 17-20th May! 3. QRP Labs at Friedrichshafen Hamfest, 1st-3rd June! Since summer 2014, QRP Labs kits were warehoused and shipped by two part-time ladies in Japan. Due to the popularity of the QCX CW transceiver kit it was impossible for them to keep up with the order volume. To date, 4,574 QCX kits have been ordered. It's a huge number, since 21-Aug-2017! Therefore, we decided to move QRP Labs shipment operations to QRP Labs QTH in KM46. Here we have hired a full-time employee dedicated to shipping, who will quickly catch up the pending orders, and in future will ship out all orders the same or next business day following order placement. The relocation of the kit stock has taken a lot longer than originally expected. But finally all of the export procedures and paperwork, import procedures, customs, tax, fees etc have been arranged and taken care of. The kits cleared customs on 11-May-2018 and are in domestic courier transit, arriving Monday 14-May-2018. Now we will quickly catch up on the pending orders backlog. Four Days In May (FDIM) is an annual gathering of QRP enthusiasts taking place in Dayton OH, US alongside the famous Dayton hamvention. This year, QRP Labs' Hans G0UPL is presenting the first of the FDIM seminars on Thursday 17-May-2018 with the title "Modern QRP Rigs and the Development of the QCX CW Transceiver Kit". See the FDIM web page for more information on FDIM: http://qrparci.org/fdim . The presentation will also be recorded and later broadcast by the Ham Radio Workbench Podcast and I will post more information on this when available (probably in next month's newsletter). 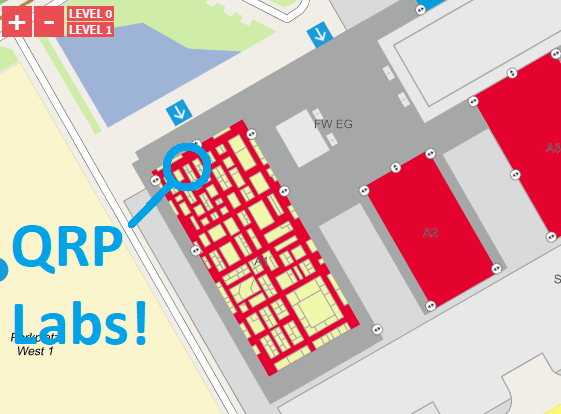 QRP Labs has a table at Vendors' evening at the FDIM venue on Thursday evening. The table will be manned by Hans G0UPL and Dave VE3KCL (a.k.a. 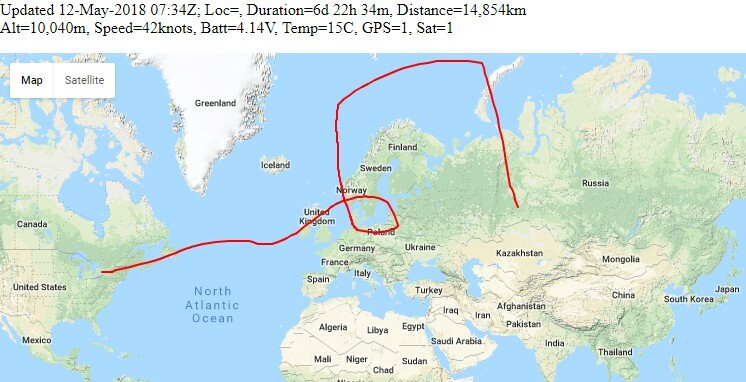 "Balloon Dave" see http://qrp-labs.com/flights/u3b17 and http://qrp-labs.com/flights/u3b18 for current flights, more information on these further on in this newsletter). QRP Labs also has a booth at the main hamvention on Friday/Saturday/Sunday, again manned by Hans G0UPL and Dave VE3KCL (except when one of us is roaming the hamvention). The booth is number 6414, in building 6. It's very close to the entrance ticket gate of the whole hamvention! So just take a right turn right inside the ticket gate: come and see us FIRST! At both the vendor's evening table and the hamvention booth, we will hopefully have on sale a good range of QRP Labs kits, as well as a selection of working kits to discuss and demonstrate; if you already have everything you need then just come and say hello, it is always nice to meet fellow QRP Labbers! 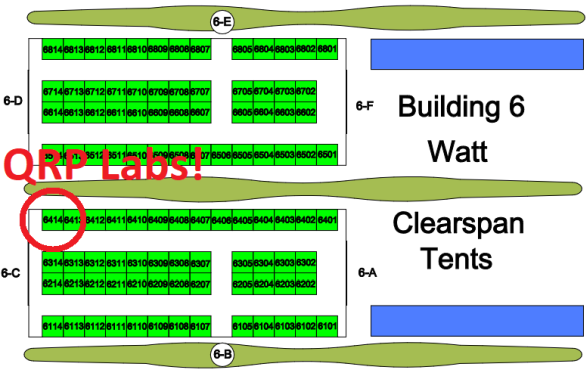 Technically building 6 is a TENT... but the blurb assures us that this "Clearspan" tent is a very NICE tent... anyway the content is what is important, right? Note that my attendance at Dayton FDIM does not affect the backlog of shipments that have been awaiting the shipment operations relocation from Japan. I am not directly involved in shipping anyway. The shipments will continue to be handled as normal here at HQ in my absence. If you have a kit on order, and you are going to be at Dayton, it would be preferable if you could please still wait for it to be posted in the normal way (pending shipments will catch up very quickly now, see above)... please don't ask to collect it from Dayton - there is always a huge amount going on, and any disruption to the natural flow is likely to incur mistakes. 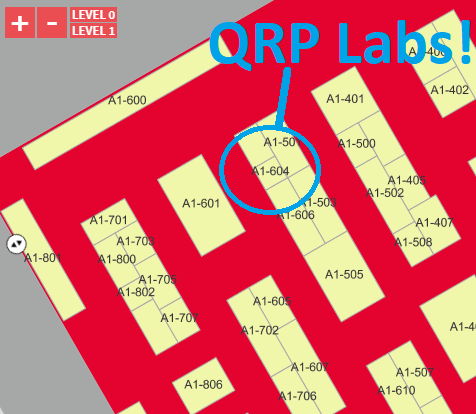 QRP Labs has a booth at Friedrichshafen, Germany. We are at A1-604 in the main exhibition hall A1. Our booth is right next to good friends Palm Radio (keys). We will have on hand a good selection of QRP Labs kits to demonstrate and to sell; and will look forward to meeting lots of QRP Labbers, just come to say hello! "Out of the ashes of ten years of ethnic repression and the Kosovo War in 1998, the amateur radio service in Kosovo was reborn in 2012. 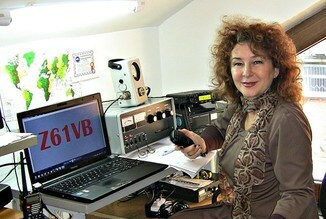 Vjollca Belegu, Z61VB, Kosovo’s (Kosova) first YL ham radio operator, survived this dark period in Kosova’s history, and 25 years after ham radio was closed in Kosova is helping to re-birth the amateur radio service as the President of the Kosova Amateur Radio Association. Vjollca, Z61VB, tells this important story in this episode of QSO Today." Eric Guth 4Z1UG, producer of the QSO Today Podcast, is donating 3 QCX 5W CW transceiver kits to Vjollca's students at Pristina University, to help re-birth amateur radio in Kosova. Regardless of history and any politics, which should be absent from our global fraternity of amateur radio friendship, we should all be encouraging the growth of amateur radio wherever possible, particular among young people. QRP Labs is matching every donated kit one for one. If you wish to donate a QCX kit to this worthy cause, then please order a QCX as usual at the QRP Labs shop, and state in the "comments" section of the order form that you want this kit to be donated to Kosovo; or alternately email QRP Labs sales with the order number. Just to re-iterate: QRP Labs will match all donations one-for-one, as our special contribution. If you purchase a QCX kit for Kosovo, we will send them TWO kits. And for example for Eric 4Z1UG who is sending three kits, we will actually send SIX kits. 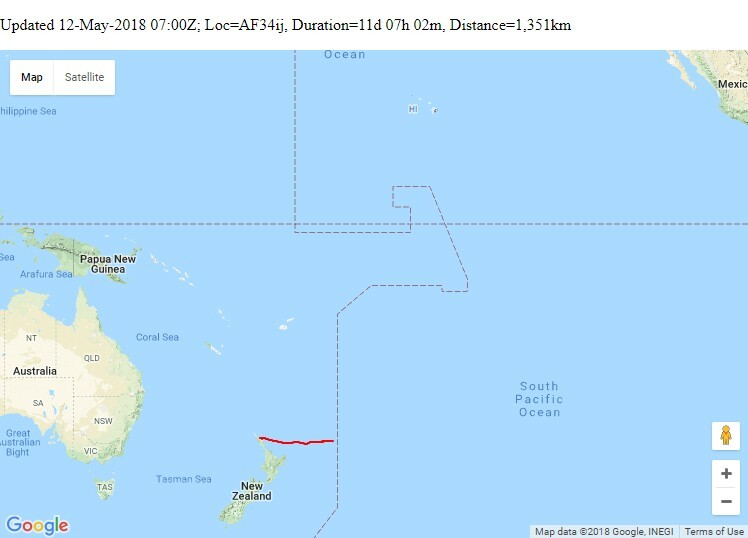 Dan and his crew set sail from New Zealand on 07-May-2018 and will be travelling to US via brief stops in Tahiti and Hawaii for supplies. BON VOYAGE! There have been lots of QRP Labs balloon flights since the last newsletter... here is a round-up of some of them! First off, big congratulations to Bob ZL1RS for his first circumnavigation flight, BB05. The flight uses the special modified Ultimate3S kit firmware on a custom-made lightweight PCB. The balloon is a larger than normal custom-made balloon envelope hence the high altitude around 13,000m. The balloon transmits WSPR and JT9 on 20m band. See http://www.qrp-labs.com/flights/bb05.html for photos, LIVE tracking and more details! Jim N2NXZ's amazing flight continued its 2nd round-the-world trip but was cruelly denied the honour of a 2nd circumnavigation, last reported on 17-Apr-2018 over Colorado US, and most likely landing that night. 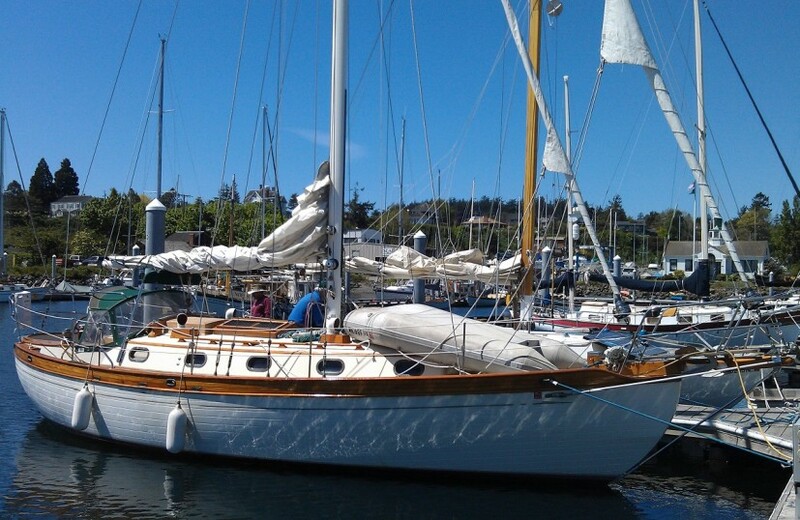 An amazing journey lasting 63 days, a QRP Labs record-breaker! All with two cheap Chinese balloons costing $1.50 and a custom-made PCB hosting an Ultimate3S transmitter with modified firmware version. See http://www.qrp-labs.com/flights/u3s22.html for more details. Jim's U3S23 flight was launched without incident on 08-May-2018. This flight used a custom PCB and the special Ultimate3S kitballoon telemetry firmware. The callsign this time was G0UPL! The transmitter schedule was also unusual in that Jim included DFCW transmissions of the 6-character Maidenhead grid subsquare and altitude. Maybe this is the first DFCW transmission from a High altitude balloon? DFCW is slow speed Morse where the usual "key-up" and "key-down" states are both transmitted, but "key-down" is differentiated by a small upward frequency shift of typically around 5Hz. It is easy to read on an Argo screen (or similar spectrum analysis software), and being continuously keyed it doesn't suffer any chirp. The Ultimate3S kit is mostly used for WSPR transmissions but is also capable of a large number of other modes, don't forget to give them a try. You can encode data such as the position and altitude into all free-text transmission modes. Unfortunately the balloon envelope came down in the Atlantic on the 2nd day but in its short flight, the transmitter performed well. See http://qrp-labs.com/flights/u3s23 for more details. U3B14 is the 14th test flight of the new QRP Labs balloon tracker project hardware and firmware. U3B14 completed a whole circumnavigation (blue line below) and half a second lap (red line below). 18 days flying. A great flight, and the first U3B circumnavigation! See http://qrp-labs.com/flights/u3b14 for more details. U3B15 is the 15th test flight of the U3B, and flew well for over 8 days, finally coming down in the Pacific south-east of Japan. See http://qrp-labs.com/flights/u3b15 for details. U3B16 was the 16th test flight of the U3B tracker and landed in the North Atlantic on its 2nd day. See http://qrp-labs.com/flights/u3b16 for details. U3B17 is the 17th in the U3B test flight series. It was launched on 30th Aptil and is at time of writing still flying well, at an altitude around 11,000m, over the North Pacific. It had a close call over Mongolia on its 11th day (10-May-2018), it must have picked up some ice particles and it started descending soon after dusk, due to the extra weight. During the descent the temperature rose, above freezing (0C) at about 5,000m altitude. That thawed out the battery and the transmitter came back to life, reporting the altitude during the descent. It was last heard from at 3,180m and the descent was observed to be slowing. The following morning it showed up again at 11,000m altitude! So clearly it managed to get rid of the excess weight before hitting the ground, and ascended back up to cruising altitude! Not far short of a miracle! See http://qrp-labs.com/flights/u3b17 for more details, LIVE tracking, and weather projections. Coming to the US West coast soon! U3B18 is the 18th in the U3B test series and was launched on 06-May-2018. It is cruising at around 10,000m and has taken an interesting path, way up North. It is still flying at time of writing, over central Russia. See http://qrp-labs.com/flights/u3b18 for LIVE tracking, details and weather projections.